1 ) Add a category to each room type. 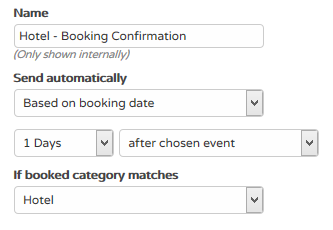 2) Go to “Settings > Booking Form > Manage booking forms > Edit” and set the “booking engine category picker” to “If no category is chosen try to set category automatically”. 3) Open the email template you have created for this category under “Settings > Languages and texts > Email templates”. Pick your choice for “Send automatically”. Choose the category you want to send this email to under the drop down “If booked category matches”. 4) To activate automatic category picker go to “Settings > Channels > Booking.com/Expedia > Edit and turn “Set category automatically” to “ON”.